Are Carnations Perennials or Annuals? How Do Florists Dye Carnations? Can You Grow Carnations in Zone 7B? The simplicity, fresh scent and long life of the carnation make it one of the most popular flowers for floral arrangements. It's also often used in bridal bouquets and boutonnieres. There are many colors of carnations, each with their own meaning. Pink carnations refer to a mother's love. White carnations symbolize good luck and pure love. The large, or standard, carnation has one large flower per stem. The flower is 2 to 3 inches across on a 28-inch stem. The most widely found colors are yellow, orange, red, pink, mauve, white and bi-colored. 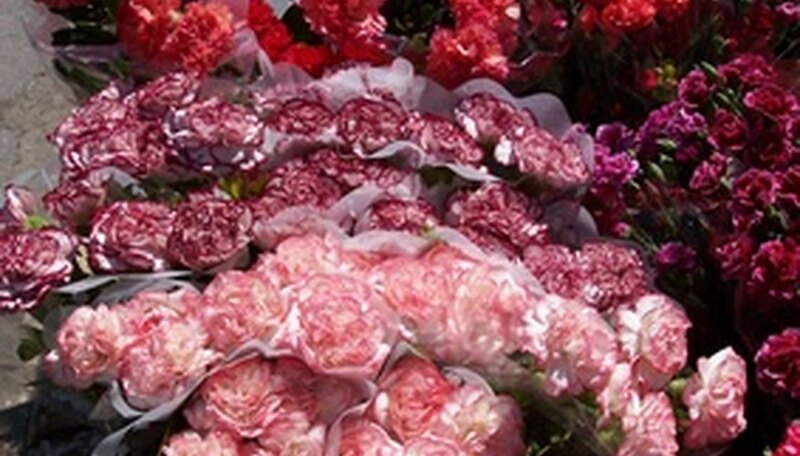 The most popular large carnations are Sims, Mediterranean and Sidney Littlefield. There are carnations with frilled petal ends. These varieties are called Butterfly, Chinese or Mignon. 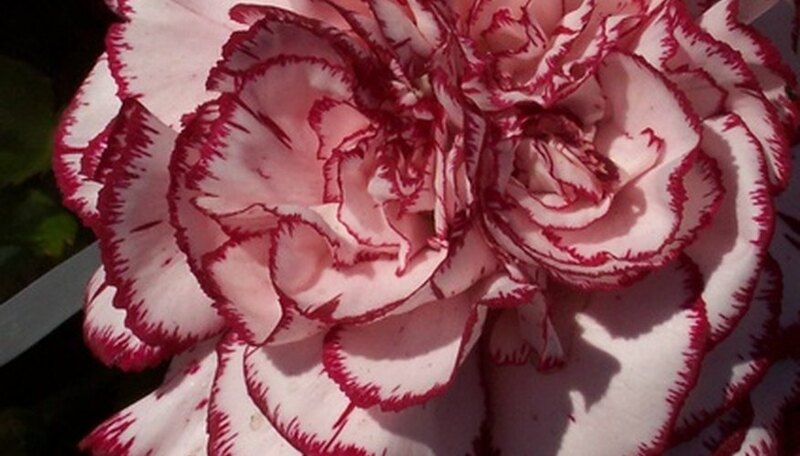 This carnation type is found mostly in pink, purple, white, red and bi-colored. Mini, or spray, carnations grow 3 to 7 flowers on each stem. The flowers grow 1 to 2 inches across, with a stem height of 16 to 24 inches. The most popular colors of the mini carnation are pink, red, yellow, orange, white and bi-colored. The varieties that are most easily found are Rony (red), Exquisite (violet), Elegance (pink) and Tibet (white). Mini pink and red carnations are widely available for Valentine's Day. Dwarf, or micro, carnations grow 2 to 4 flowers per stem. The blooms are a tiny 1/2 to 3/4 inch across. The stems reach up to 16 inches. These small flowers are found predominantly in white, yellow, red, purple and bi-colored. Dianthini are a type of dwarf carnations with white-edged petals. Dig around the mature carnation clump using the shovel. Dig down about 10 inches to reach the roots under the clump. Pull the clump from the hole. Pull the clump into three to five equal sections. Each section can be transplanted. One of the divisions can be returned to the current hole. Choose a full-sun, well-drained location to plant the divided carnation clumps. Dig the hole at least 12 inches deep and twice as wide as the division to be planted. If the soil has already been worked so it is loose, you can use a hand trowel to dig the hole. Mix about 25 percent organic matter, like compost or leaf mold, into the removed soil. If planting more than one division, dig the new holes 6 to 12 inches apart. Plant the division in the hole at the same level it was before and backfill the hole with amended soil. Water and apply 1 inch of compost or mulch. Water every seven to 14 days if it does not rain. Monitor the carnation plants as they bloom to encourage the plants to bloom for as long as possible. Use the garden shears to remove the spent blossoms as soon as they fade. This will keep the carnation plants blooming for as long as possible. Cut the desired carnation stems for floral arrangements using the garden shears. It is important that at least three leaf nodes remain at the base of the stems for the plant to continue blooming. A leaf node is the point along the stem where the stem swells for a leaf to grow from the stem. Cut just above a leaf node to remove a carnation and stem. Remove all leaves from the stems that will be under the water level when the carnations are in a vase. Cut the bottom inch from the ends of the carnation stems at a 45-degree angle and place the cut carnations into a vase of cold water immediately. Carnations are herbaceous perennial flowers and perform as perennials in the warmer climate of U.S. Department of Agriculture Hardiness Zones 6 through 9. When grown in colder climates, carnations become less reliable as a perennial, and are often treated as annuals. Maiden Pinks (Dianthus deltoides) are annual plants, which reseed easily. The blue-green foliage forms a dense mat in cooler climates, but the centers of Maiden Pinks die out in hot humid weather. Grow Maiden Pinks in well-drained, alkaline soil in full sun. They are drought-tolerant. Sweet Williams (Dianthus barbatus) are treated as annuals in cooler climates and as perennials in warmer climates. They are often short-lived, even as perennials. Plant Sweet Williams in full sun in well drained alkaline soil. Divide every 2 to 3 years to prolong their life. Sweet Williams will reseed. If the seeds are removed, new plants will form around the base of the old plant. Carnations (Dianthus caryophyllus) are one of the most common cut flowers used by florists. Grow carnations in well-drained alkaline soil in full sun. They are more tolerant of humidity than other varieties of dianthus. Dianthus can be grown as border plants, groundcover, underplantings for roses and other shrubs, or in containers. Dianthus are susceptible to Fusarium wilt, root rot and crown rot. Aphids, grasshoppers or mites may attack dianthus plants. White carnations that are fully open and as fresh as possible are the best candidates for coloring. An open flower allows the spray to reach between the flower petals and the inside of the flower. The carnation is held by the stem and the spray can is held far enough away from the flower so that a fine spray is applied. Several coats of fine spray work better than one heavy coat which can leave unsightly drip marks. To color just the flower edges, the paint is sprayed in a shallow dish and the flower edges are dipped in the paint. Trim about 1 inch of stem off the bottom of each carnation, using a sharp scissors or a knife, every two to three days. Cuts should at a 45-degree angle to allow as much water uptake into the stem as possible. At the same time, trim off any leaves of the carnation that will be submerged under water in your vase. Keep the water in your vase of carnations clean and full. Change the water in your vase every day, or every other day. Check to make sure all the stems are submerged into the water at all times. You may add floral preservative to your water or 1/4 tsp. of boric acid to one quart of water to further extend the life of your carnations. Place your bouquet of carnations away from direct sunlight and heat. 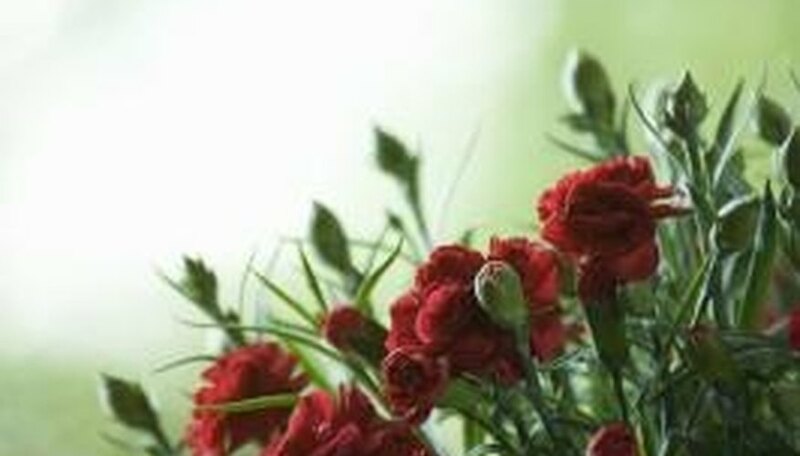 Carnations prefer a cooler atmosphere and will live longer if kept cooler. Move your carnations to a cool, 40- to 50-degree Fahrenheit area overnight to add days to your carnation life. Ruffle the petals of your carnations, gently, every few days. By ruffling the petals you are stimulating the flower to take up more water and, thus, live longer. Carnations are part of the flower genus Dianthus. In Greek, the name Dianthus means, roughly translated, flower of the gods or flower of love. They share the Dianthus family with Sweet Williams, Allwood Pinks and other similar plants. Plant a garden for the clove-like aroma of carnations. Though many modern carnations offer more beauty than fragrance, carnations like the heritage "Malmaison" and hybrid "Can Can Scarlet" offer spicy scents. Select from traditional pink shades or a range of single and mixed colors. Carnations come with white, yellow, apricot, green, deep red and purple blooms. Popular mixes include white with crimson borders or candy-stripe red and white blossoms. There are hundreds of carnation cultivars to add to your garden. Plant miniature varieties in containers and hanging baskets. Standard carnations thrive in full-sun borders and mixed with wildflowers. Pick cutting carnations by their bud stage. According to Michael Reid at the University of California, Davis, Department of Plant Sciences, choose flowers at the paintbrush stage, where the colorful flower petals stick straight up from the green bud. These open quickly into full bloom. Perennials are plants that die back to the ground in the fall or winter. These plants grow back from the roots in the spring. Perennials last several years without having to be replanted. Carnation flowers last for several years once established. The plants increase through seeds and plant divisions. Just dig the plants in the fall, cut into sections and replant. Carnation plants are perennials that produce flowers the first year they are planted. This type of flower is available in many different colors and sizes. To switch out carnation plants, dig up the roots to remove the undesirable perennial from the garden. Replace the plant with the desirable carnation variety. Moisten potting soil with warm water and mix well to maintain an even level of water throughout the soil. The soil should leave your palm damp when you squeeze it in your hand. Fill the growing container with the soil. Scatter the red carnations evenly across the surface of the soil. Spread soil over the seeds just enough to cover the them. Place the growing tray into the plastic bag and seal it. Place the container in a warm area or on a heat mat to keep the seeds warm while they germinate. The heat speeds up germination, which may normally take 8 to 10 weeks. Remove the plastic bag when most of the seeds have germinated. According to Jeanne Rose, master gardener for the University of California, set the growing tray in direct sunlight to continue growing the seedlings. Water each day to keep the soil damp but not saturated. Transplant the seedlings into separate containers once two sets of true leaves appear. Continue growing out the red carnations until a healthy root system develops. Once the carnations have a good root system, plant them outdoors in the garden. Mulch the red carnation plant with dead leaves or straw before the first frost hits in the late fall. Remove the mulch as soon as leaves appear in the spring. Carnations can bloom for six to eight weeks, beginning in June. Carnations can be grown in many colors and last a long time after being cut. Place a single carnation with two additional carnations of different colors. For example, if you have purchased three red, three pink and three white, then place one red, pink and white together. Place the three carnations of different colors into the center of the vase. Add a sprig of baby's breath to the combination for additional color and texture contrast. Baby's breath is inexpensive and can be purchased at supermarkets and home and garden centers. Begin grouping three additional carnations of different colors and place them on the right side in the vase. Group the final three carnations of various colors. Place a sprig of baby's breath to the back of the carnation trio and place them on the left side of the vase. Add 1 cup of room temperature water to the vase. Place a ribbon or bow in a decorative fashion at the front of the vase and present it as a gift or place on your table or kitchen counter to enjoy. Carnations (Dianthus caryophyllus), hardy in USDA zones 6 to 9, grow in zone 7b. Carnations like sunny sites and nutrient-rich, well-drained soil. Though carnations are perennial plants, they are often grown as annuals in cold climates.